This is another story of a collected piece of paper that I haven’t been able to toss. Up to now. If you remember the logo, it’s Dave Barry who used to write wonderful one-page witty stories for the Washington Post Magazine. Maybe he still does. This page dated June 17, 1990. This particular story presented a look at a summer sailing trip he made with several families, including children. 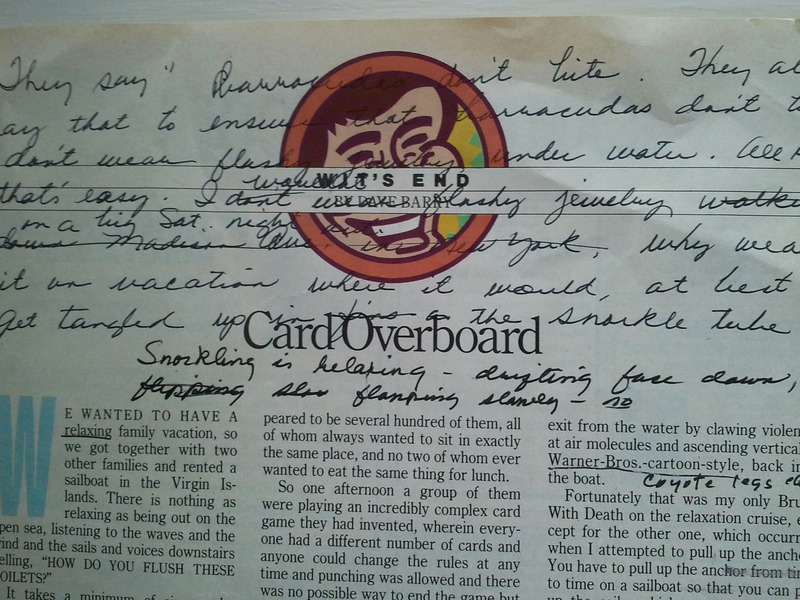 After reading it, I wrote some lines across the top from a sea-faring adventure I’d had and wanted to write about and the piece of the paper went into a stack to be unearthed these many years later. And since we’re about to the weekend when people make their last trip to the ocean (people, that is, who live near an ocean/lake visit for midwesterners) it seemed the perfect time to present my ocean story. That’s as far as I got; so here’s the rest of the story from living in St. Lucia, many years ago, and my “Brush With Death,” as Dave Barry called it. We lived on the side of a mountain above a banana plantation but there was a tiny beach, mostly rocky, at the base of the hill that let into the ocean, and the water clear enough and shallow enough that we’d spent time drifting above a coral reef and watching seahorse daddies with fat pouches of young and brilliant trumpet fish. However, my friend’s back went out and I was bored. Intrepid traveler and all, I decided to go swimming alone. As I said, the water was shallow. Probably the first rule to swimming in a deserted cove is not to go alone, but I hadn’t read that rule. Snorkeling is relaxing – drifting face down, fins flapping slowly for balance, sort of like a big fish. The biggest challenge is getting into the water in the first place, backwards, over rocks. But I managed. Slowly. And didn’t lose my flippers. So I watched the fish homes we’d come to recognize on other days and then I became adventurous, looking for new territory. That may be the second rule to swimming in a deserted cove:don’t get too cocky. But I did. And noticed how the bottom suddenly dropped like a cliff. Interesting! So I drifted on, paddling lightly, watching and exploring. Far below, I saw a sudden shift as a long shadow became a barracuda. I’d wandered into someone’s territory. And barracuda decided to check me out. My later, rational mind tells me that if the barracuda had wanted to catch me, it would have. At the time, I wasn’t exactly rational. I swam faster than I’d ever swum in my life, arms and legs flailing like some cartoon character, a Road Runner/Coyote, perhaps, in the water. The rocky bottom leveled and I pulled myself out, panting: a moment of high relaxation, lemme tell ya. That was it. I walked back up to the house. Vowed never to go swimming alone again. And I didn’t. And the experience by itself too short, really, for its own story. Ah, but an unearthed piece of paper from twenty-two years ago which I have saved for the perfect moment? Now, that’s the real rest of the story! What end-of-summer story have you been hording all these years, waiting for the perfect moment? Is it time to reveal? LOL! Ya got me, girlfriend. I cannot top that one. Loved it. Thanks Valorie! Glad you laughed.